Renewable resources have been very significant for EBRD's investments in Turkey. The bank has so far invested over 1.8 billion euros in the sector since its entry to Turkey in 2009. Andi Aranitasi, a senior banker at the European Bank for Reconstruction and Development (EBRD), said yesterday that they support Turkey's bid to prepare a new renewable energy support mechanism for investments after 2020. The EBRD official said that currently not having a guarantee purchase price makes Turkey's renewable energy projects more challenging to finance because it requires lenders to make long-term price forecasts and to bear market risk. It will still be possible to finance good renewable projects but the financing structures would be more conservative, he said, adding that the government would like to go with a different system other than the current Renewable Energy Support Mechanism (YEKDEM). 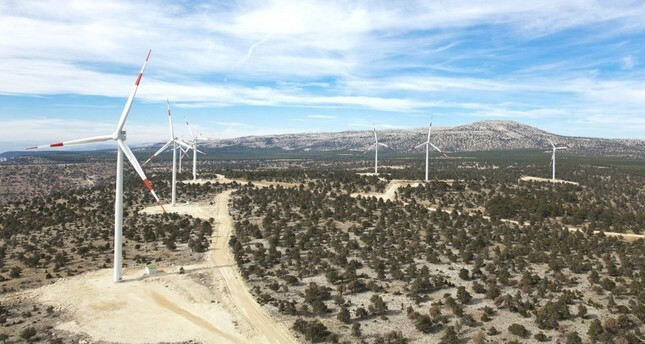 Turkey has feed-in-tariffs for renewable energy power plants under the YEKDEM. The feed-in-tariffs are $0.133 for solar and biomass, $0.105 for geothermal, $0.073 for wind and hydro plants and it is valid for 10 years. The Energy and Natural Resources Ministry plans to end YEKDEM by 2020 and it is yet uncertain what will happen after its termination. "They are intending to come up with a new mechanism on how to support renewables. As the EBRD, we are working with the ministry to see whether we can come up with a new scheme which hopefully they will announce toward the end of this year that will support the renewables after 2020," Aranitasi said. "Still the idea is to offer minimum guarantee for revenues. I think if we manage to achieve [this], it will allow renewables to continue to grow - even the guarantee is minimum, it will be enough to support. Renewables are big cornerstones of Turkish energy strategy," he said. Aranitasi gave the examples of North Africa, Latin America and Gulf States where purchase agreement prices for solar have come down to $0.02-$0.025 and is valid for 20 years. "The new scheme will be a different form of support but it will be enough to allow the renewables to grow," he underlined. He also said that renewable resources are very significant in terms of the EBRD's investment in Turkey, which is over 1.8 billion euros ($2.12 billion) since they started working there 10 years ago. Aranitasi explained that about 1.6 billion euros of the total amount has been channeled to power sector in Turkey. "A total of 850 million euros is actually for renewables and 550 million euros for distribution of both electricity and gas. We have invested around 175 million euros for gas fired power plants. Our energy portfolio is performing well and renewable energy projects are doing somewhat better than other projects," he said. Aranitasi indicated that the EBRD offers Turkish companies tailored multi-currency loans to meet their financing needs. He reminded the media that earlier this year the bank has supported a major milestone in the privatization of state-owned power plants in Turkey with a $55 million dual currency loan where $35 million in dollars and the equivalent of $20 million in Turkish lira to Entek Elektrik Üretimi AŞ, a subsidiary of one of the Turkey's largest conglomerates, Koç Holding. "There are companies borrowing in dollars but usually their revenues are dollar indexed, like in the case of YEKDEM renewables. Where our borrowers have revenues mostly in Turkish lira, we also try to lend in lira to match the revenue stream to their debt obligations," he explained. In Turkey, some companies - and among them energy companies - asked for restructuring of their debts to banks due to floating exchange rates as they borrowed in dollars. The Turkish private sector has invested $95 billion in the last 10 years in electricity generation and around $60 billion of this amount have been borrowed from banks, of which are mostly Turkish banks, a Turkish Industrialists and Businessmen Association (TÜSIAD) report showed. The current debt stands at $43 billion while $37 billion of this amount belongs to Turkish banks. Of the $37 billion, YEKDEM projects have a share of around $22 billion while $15 billion is for other gas, domestic and imported coal power plants. "Our financing structures are robust and so far no energy company has requested restructuring of an EBRD loan," Aranitasi pointed out. Aranitasi also said that the EBRD traditionally invests annually around 200-300 million euros in the power sector in Turkey and aims at maintaining the same level next year. He also reminded the EBRD supported Turkey's Akfen Renewable Energy with $102 million for 13 renewable power plants last week. "We may announce one more project in the last quarter," he said, refraining from sharing further details. Since 2009, the EBRD has invested nearly 11 billion euros in Turkey - a top destination for the bank's finance. In 2017 alone, the EBRD invested 1.6 billion euros in 51 projects in the country - nearly a third of this financing was provided in Turkish lira. Half of the bank's portfolio in Turkey constitutes investments that promote sustainable energy and resource use.